Looking Forward: What's Next for the New York Islanders? Looking Forward: What’s Next for the New York Islanders? The New York Islanders are in the midst of a nightmare-like season that has gone from bad to awful, even without the team playing. The team is going to trade Vanek and MacDonald, and John Tavares went down in Sochi for the rest of the season. Thankfully, the injury does not appear to need surgery and the Captain will be ready to go next year, but by that time the team will look different than it does now. So, what’s next? and will have to move someone up to the first line once Vanek gets traded. That could be any number of players currently on the team such as Grabner, Bailey, Lee or others, or it could be a player who comes over via trade at the deadline. Replacing Vanek will be almost impossible, but it will be nice to see the future of the organization with for for a few weeks before the end of the season. Once Andrew MacDonald is traded, I wouldn’t be surprised to see Scott Mayfield get the call to the Island. For Garth to avoid a significant amount of criticism, he needs to get back at least what he traded to get Vanek in terms of value- a first round pick (lotto protected), a second round pick, and Matt Moulson. He’s already reportedly turned down an offer with more coming in, so it appears this will drag on until the deadline actually hits. I don’t think the team will be looking for another established scorer, but more of a prospect who’s just about ready to be in the NHL. With such interest in Vanek at the deadline, I think that this is a demand that can be met. Although the season is still going on, it’s never to early to start looking at the offseason with the Islanders. This offseason is one of the most important ones in a long time for a few reasons. John Tavares needs to rehab his injury. It looks like he will and doesn’t need surgery, which is huge. Assuming he comes back next year fully healed,the team will have dodged a major bullet and will still need to fill some roles in the offseason. The first line, assuming they don’t acquire a new winger in the Vanek trade, will need to be addressed and with so many free agent forwards this year, they’d have to walk away with someone, whether it be Gaborik, Callahan, even Vanek or someone else. in their respective leagues and may be able to be factors before we know it as well. PK Subban has become the prized jewel of Islander fans, but if you ask me I don’t see the Islanders acquiring him for two reasons- a) If they were to offer sheet him, they’d have to compensate the Canadiens with at least a few first round picks, or b) If they were to trade for him, his value is insanely high and would cost a lot. Therefore, I don’t see the Islanders doing much in terms of improving the defense in the offseason from outside the organization- sorry fans! The goaltending is also very interesting. While the front office does like the goalies in the pipeline, it would be irresponsible to ignore some of the names that will be available, including Miller and Hiller. Depending on the cost associated, I wouldn’t be surprised if the Isles bring in goalie not named Nabokov. The Islanders are definitely an interesting team right now. Coming off of a playoff year to this hurt a lot, but the future is extremely bright and last year might have just been a taste of what may become a reality every year, starting next year. 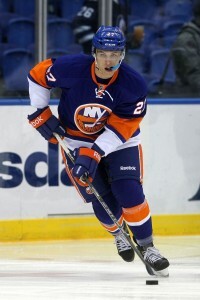 Check out our partners at TiqIQ for the best deals on New York Islanders tickets for all 2013-14 games.